Blue-spotted grouper larvae (Cephalopholis argus) were raised from wild-spawned eggs at 77-79F on wild copepods. First record of Blue-spotted grouper culture. Groupers are medium to very large carnivorous, slow-moving, bottom-associated fishes comprising 19 genera and 110 species. They are important food fish that have been overfished in many regions with twenty species are at risk of extinction. Species in the genera Epinephelus, Plectropomus, Cromileptes, Mycteropera are commonly cultured for food, especially in Asia. The blue-spotted Grouper (Cephalopholis argus) is a shy, beautiful, medium-sized serranid that occurs mostly in shallow waters less than 30 meters and widespread throughout the Indo-Pacific. C. argus was reared from a single spawn collected near sunset in waters off Oahu’s west side in May, 2012. C. argus eggs are pelagic and measure about 0.8 mm in diameter. This species has beautiful larvae and juveniles. 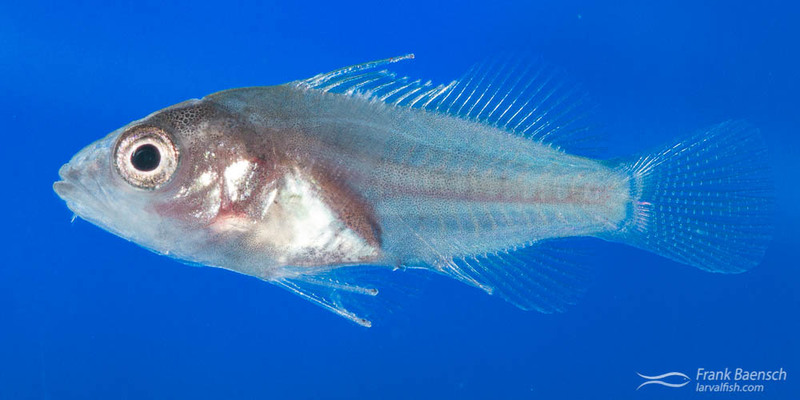 Features of the larvae include the early forming, large pectoral fins; pronounced head spination; the long, ornamented dorsal and pelvic fin spines; and red pigmentation at the base of the caudal fin. Blue Spotted Grouper (Cephalopholis argus) larvae reared in the laboratory. C. argus larvae were not difficult to rear, despite their relatively long larval phase. The larvae fed on copepod nauplii from hatching through settlement. The C. argus larval period in culture was about 60 days. The early juveniles have a greenish body covered with bright blue spots. At this stage they are very aggressive.